Yeah, she posed herself with that leg and off the shoulder gaze. You can't buy this kind of sassiness. It's getting harder to remember this leggy girl as the fuzzy cotton ball puppy we brought into our home just a few weeks ago. Can you believe it? CCI's extraordinary E litter, born on September 14, will celebrate their four month birthday on Monday. 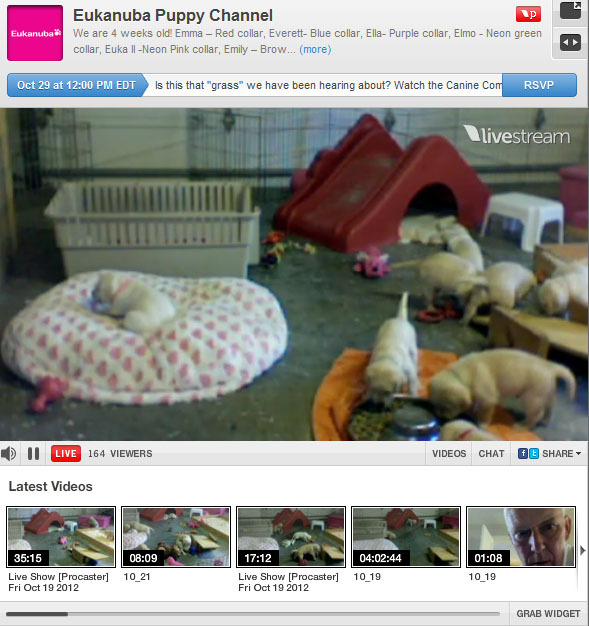 We met the E litter (Emma, Everett, Ella, Elmo, Euka II, Emily, Ethan and Eliza) as tiny hamsters on the Eukanuba Channel Livestream. Immediately upon our first sighting of these puppies with their newborn eyes and ears closed, we watched in fascination as they nearly time lapsed into active eight-week-old puppies. For those with a yearning to reminisce on that earlier time of innocence, the Livestream is still open with a video library of the Best of the E Litter recordings. But holy cow, look at Euka now, will ya? At four months she's showing promises of being a noggin-turning beauty, isn't she? The trifecta of brains, beauty and that sassafras attitude has us expecting big things of this girl. When the Mighty Micron was this same age, we covered his early progress as a puppy in training for Canine Companions for Independence at A Fine Taste in Shoes. 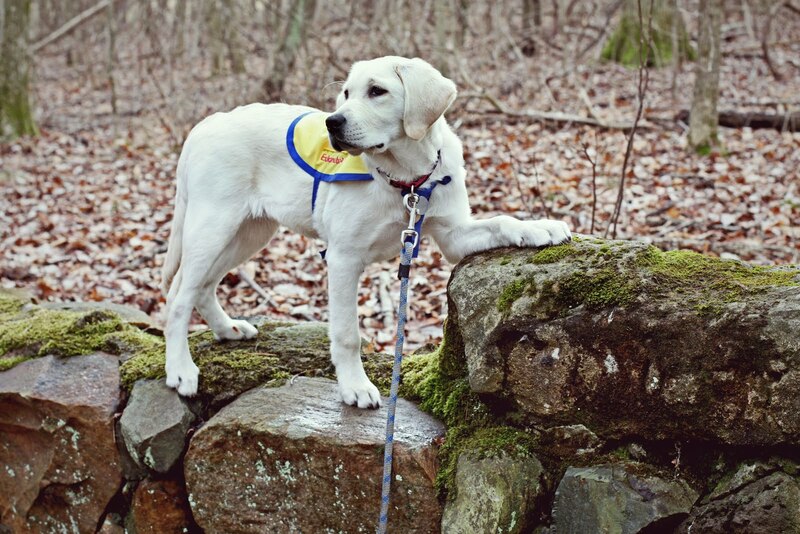 And with a completely different personality, Yaxley's Four for Four showed us how this yeller feller was doing at a mere sixteen weeks old. So how's the polar bear pup doing, you ask. Ah, a fine question that. I offer you Euka's Four for Four. That's Euka on the dog bed. Eating one kibble. One. We knew early on that Euka II would be assigned to us to raise for CCI. So we tuned in to the Livestream coverage with rapt attention on everything that was Euka. From growth development (Look! She's walking! Well, kind of.) to attitude (huh. She's a little bossy, isn't she?) I was ridiculously jazzed to have this online version of "being there". But observing her habits at the communal dinner bowl, I had a nagging bit of concern. Euka was just not showing herself as the voracious eater I'd experienced before with our CCI pups. I fretted over this. How does one train a puppy that is not food motivated?, I wondered. Not exactly driven to the point of hand wringing, knowing I had plenty of resources to hit with other experienced puppy raisers. But still, would this be a new challenge? Ah, but it ain't no use use in putting up your umbrella until it rains. Or something like that. From the first food bowl served at the popular Sword House eatery, Euka has shown a completely normal appetite level for a lab puppy. By normal, I mean she finishes her meal in time to check out how the other dogs are doing. You gonna finish that? she wants to know. Then the three go in a musical chairs rotation to lick each other's bowls clean until all that's left is a spit shine. Yep, that's our normal. do to get some attention around here? While some folk admit a squee-worthy love of tiny puppies, they cringe at the thought of housebreaking the little critter. Especially during the winter months. Oh, but not me. Educating the proper use of nature-based toileting facilities is just a blip compared to all the other awesome stuff that comes with the puppy package. However y'all, I will admit it to be a happy day when the yow-gotta-potty neurons start firing on their own accord. Ever the clever girl, Euka has connected the back door with bladder freedom and will hang out there until I take notice. A soft whine, she knows, will get faster action. This week while working from home, Euka decided to kick things up a level. I will not be ignored, says Euka. 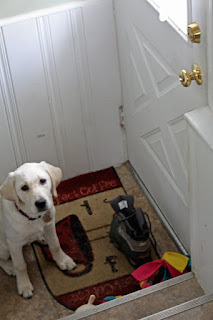 She walked into the kitchen, picked up my snow boot by the steps, looked at me until she got some eye contact and then took the boot to the back door and dropped it. The first puppy we raised for CCI, the lovely Inga, did the head tilt thing as a pup. Do you think she'll keep this behavior? I asked other puppy raisers. Sometimes they do, they said. And she did indeed. We'd say In-GA to see the noggin tilt on the second syllable. Cute, cute, cute. In many ways Euka reminds us of Inga, both in appearance and personality. And oh my, that head tilt. [sigh] I love it. 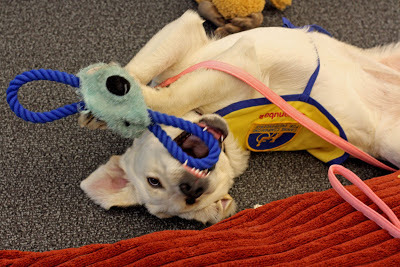 Proving herself to be made of the right stuff, Euka made her debut at Eukanuba's corporate office last week. A total success, that first visit, and I'm pretty proud of how she handled herself. With held held high and tail wagging, Euka pranced about the place like the sizzlin' hot stuff she is. Hello, she said to Everyone. Do you know who I am? She absolutely loved recess time in the outdoor dog park we have for employees' pets (Ah, smells like beagle, Bernese and chihuahua out here. With a mushroomy nuance of Micron) and quickly positioned herself into a play bow with a muddy tennis ball. Confidence abounds. Euka 1.0 and Euka 2.0 pose for their first photo op. 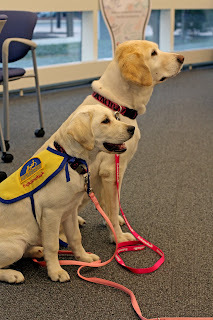 Euka also had the honor of meeting the original Euka, the retired VP of Canine Communications for P&G Pet Care. You may recall, our Euka pup will not be following in the pawprints of Euka as an officer of the company. 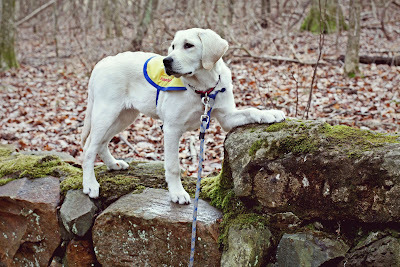 Instead, we've got some big plans for her as she prepares herself for her upcoming Advanced Training to be a service dog. More on the back story of namesakes and career destinations are on the dog blog post Introducing Euka II: She's not a tuber. Hey, I got this working hard thing down cold. When's lunch? Hey, so there ya go. Four things about Euka II at four months old. You're glad you asked, right? We're moving along quite nicely here, IMHO and all. And more Euka adventures yet to come! I can't wait to see what's she's got for us next. She is a confident girl, our Euka. I'm so glad she makes you smile. Euka is a blast to raise; we're having a great time together. How very sweet, seeing the Eukas side by side. :) And the boots and the dropping and the door! Very impressive. Good job Mom! Yep, she's pretty clever. Truth be told, I'm actually dreading the day it clicks that she can outsmart me. Shouldn't be too long now. She is getting to be super gorgeous! I am in love with her *almost* white coat :) And I'm jealous of her superior "pottying-outside-skills." Novel had the hardest time with that. Euka seems to be getting the hang of this potty thing. Such a happy thing when the pups learn to signal. 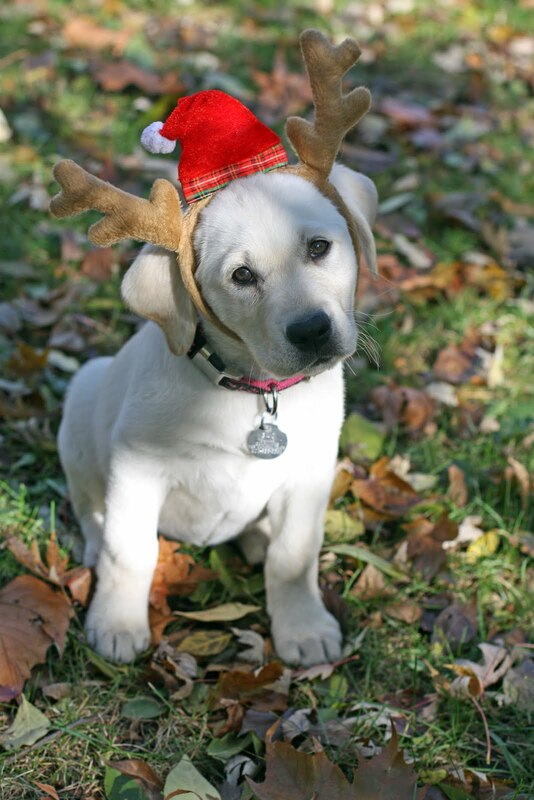 We've had some challenging puppies too [coughmicron] when housebreaking just seemed to take forever. And I would be on edge during public outings, hoping against hope for some robust muscle control on the critter. The mighty Micron had done me wrong in Target once, the big goober. But Miss Euka has seemed to turn the corner where this business of going outside to do her duty (heh heh, duty) is clicking in her noggin.